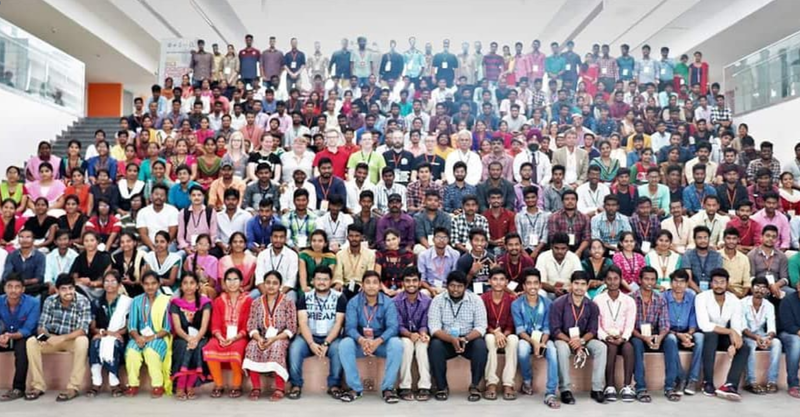 A couple of months ago a friend of mine informed me that my school, Kajaani University of Applied Sciences (KAMK), was going send a delegation to the state of Andhra Pradesh, India, to teach game development for two months. The event would be known as IGDC, short for Indian Game Development Challenge. KAMK was recruiting for the job so I applied and was accepted. I left Finland at the beginning of June and came back home just a day ago, 30th July. I will now attempt to describe the experience in words. Note that this text is written from my personal perspective and does not represent the views of KAMK nor anyone else who isn't me. At some point in time KAMK, my school, had come in contact with APSSDC, the Andhra Pradesh State Skill Development Corporation. They had agreed on KAMK providing the programme for a two month summer course on video game development. Initially the idea had been about bringing Indian students to Finland for the summer, but this was soon diverted so that instead of sending Indians to Finland, KAMK would be sending Finns to India as teachers and organizers. A friend of mine asked me to apply to be part of the delegation going to India and I was accepted. 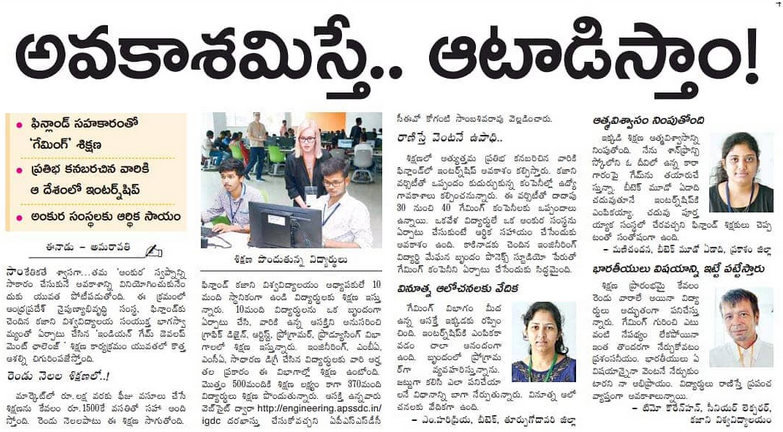 The job was to teach and coach students at the SRM University, Amaravathi. I don't remember when exactly I got to know I was going to India, but at most I believe it was two months or so before the actual date of leaving. I was working 8 hours a day on an engineering project at that point, so I had little time left for preparing course material or the like. 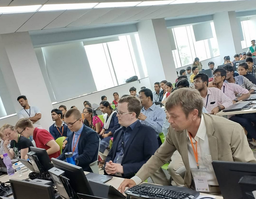 The most work I got to do regarding the India project was when me and my colleague were asked to give an online presentation to some of the Indian students along with a questions and answers session. We staid at work until 9 PM making a PowerPoint because we were told the presentation would need to happen the next day at 7:30 AM. I have to say at this point that little to no time for preparation was sort of a defining feature of this trip. Anyway, the Q&A session left me with one idea on the top of the pile: I would have to work on my understanding of Indian English accents. However, it was also nice to get to know how excited some of the students already seemed. During the same week we did the Q&A session, three people from India came to visit us in Kajaani, Finland. Two of them were from the APSSDC and one represented SRM University, the school where the course would be held. The Indians were taken hiking as well as to the sauna. Later I heard they were also taken to to see a Finnish dump pit (amongst various other things) which I thought was funny as hell. This was my first contact with Indian people, but also the first time I got to talk to our Finnish project coordinator, an all-around nice guy who would play a very important role during our stay in AP. Finally at the beginning of June 2018 it was time to leave. I left with one other person only instead of the whole team due to various reasons I will not go into now. Our coordinator, mentioned in the above paragraph, was already waiting for us at SRM University Amaravathi, the campus we would spend the next two months at. We arrived near the weekend and soon met with our own man on the spot, as well as the faculty of the school. We got to see the equipment, which seemed satisfactory, but more computers would be needed - we were going to have nearly 500 students (the APSSDC took care of this well later). The lack of equipment at this point (I assume) had to do with the fact the whole school was still being built. In fact, being built is what was happening to the whole city of Amaravathi 24/7 around the university. The story goes, a couple of years ago the state had broken up into two states and the old capital, Hyderabad, staid in the other state (Telangana), where as Andhra Pradesh was going to build it's own capital from scratch. Indeed, every hour of the day the construction of the school and the city were on-going (which did not help our night sleep at all, by the way). For our first Sunday (the working week is 6 days in India) one of our local contacts, did something very nice and took us to see his home as well as some other places nearby. That was a gesture we very much appreciated as we got a glimpse of what the country looked like outside of the borders of the campus. The area we were staying at was quite rural, so traveling on the muddy roads took a lot of time. We went to a beach as well and were probably the only people there with nothing but boxers on - I learned later Indians swim in full clothing. Of course we also went to a small temple and ate well. The first week went on fast. I taught the students some basic concepts of game programming, like what is a program main loop, what tools can you use, etc. as well as practical game programming in C with SDL2. We also talked about version control using Git. A lot of information had to be packed into a very short period of time, and I had not had the time to really prepare any materials at home. I still regret the lack of prepared material, but many people seemed to already catch on and start working on their games. I spent a lot of time in the evenings later preparing course materials for the future since I had it fresh on my mind what was going to be needed. A week later the rest of our team of 8 Finns arrived. Something that made the first weeks rough for us all was that students did not arrive in one bunch but at the rate of about 40 per day. The total amount at the end was about 480. This meant many things had to be taught again and again, often separately to only a few students at a time. Luckily Indians are (from my limited experience at least) social people and often the students would by themselves inform any new arrivals about various important things. 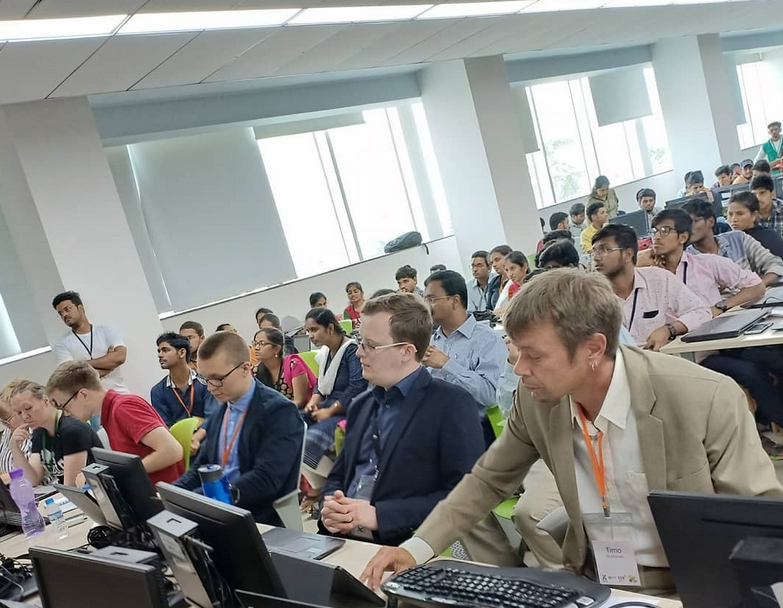 Why would a group of Finnish people be sent to India to teach game development? My understanding is that our job was to introduce the students (and the faculty) to a more practical way of learning, since Indian education is still quite conservative, often (again, to my understanding at least) being about listening to the teacher babble while taking notes. Well, our course was certainly all about practice and not about listening to the teacher babble. We did some lecturing at the beginning in the form if intensive courses, but just like KAMK game dev summer courses in Finland, most of the time the students worked on their game projects in teams of 4-10 using the tools they wanted. Us teachers, we were simply there available for any questions (or queries, as Indians say) they came up with, occasionally roaming around and checking out the progress being made. People caught onto this model surprisingly quickly, although I have some doubts that there were people even at the end of the course who would have preferred a more theoretical approach - different styles suit different people. 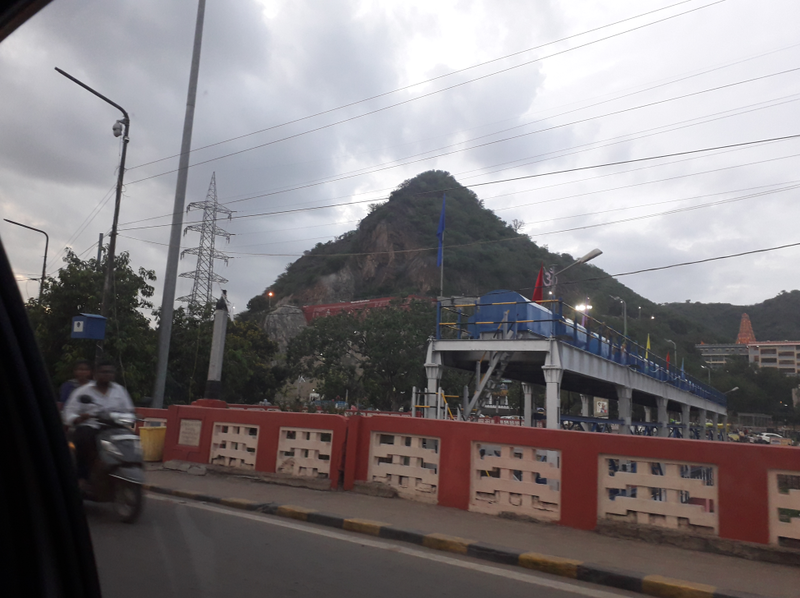 For someone like me who's never been outside of Europe, seeing even a limited part of India is an eye-opening experience. Just like the EU, India consists of various states with different cultures and languages, but being an ignoramus I had little prior knowledge about how the nation was actually organized. Now I know a little more, but just a little - we only staid in one state (AP), mostly at a university campus, apart from a night or two in Delhi (and that in the near vicinity of the airport - the furthest we got out of the hotel was the liquor store). Still regarding culture, it warms my heart to see a nation not yet completely taken over by American pop culture (Finland is just about a lost cause at this). Of course many (especially men) wear western clothing and some people know the big Hollywood or pop EDM hits, etc. But at least in the rural areas it seems that, despite the massive presence of American companies such as Coca Cola, Pepsi and the like, people still have their own style of clothing, music, films and customs. That is refreshing and gives some hope for the future of this planet to me. To just shortly list some differences between Finnish and Indian culture: friendliness (Finnish people don't smile at strangers that much); respect (a nobody like me will get called sir or madam in India, especially wile wearing a blazer); respect for other's time (Indians have little to no sense of punctuality); coffee (Indians have to forcefully put milk and sugar into it). I also cannot help but quote a colleague of mine: how do Indians ever get anywhere by walking so slow. And yet, we all share the same basic needs and understanding of human ethics. This summer course was the first in what is hoped to be many in the near future. Because of that our team had to learn many things in practice. Here are some of those things. Since the beginning it was planned that we would choose one team from the course who would be sent to the Slush business event in Helsinki, Finland to pitch their project and company. Immediately upon hearing about this I felt it was a bad idea as it would pitch students against one another. And I feel like that exactly happened, especially towards the end. Games are a business but at least in Finland companies tend to collaborate and share information - ruthless competition isn't that big a part of the picture, or at least that's the feeling I get. Thinking of your co-learner or colleague as a competitor only creates bad blood and burns bridges. We tried hard not to overpromise, but sometimes you should just keep your mouth completely shut instead of telling someone of the possibility of something happening. For example, we were expecting three companies from Kajaani to visit the university, but we should not have spoken about it before the companies confirmed that they were indeed coming. In the end, only one of the companies paid a visit (my greatest thanks go to Virtual Frontiers for this by the way). We had nearly 500 people working on various game projects for two full months. That's a lot of working hours, especially considering the working week is 6 days in India and the working day seems to be of a varying length upwards from 8 hours. A massive effort from some very dedicated people to say the least. All project courses at KAMK end in a post mortem session where students get to dissect everything that went right or wrong during the project period. This way students get to learn from others' mistakes and successes, but at the same time, a post mortem acts as a public revelation of a student project to the public - finally you get to show off the hard work you've done, and usually you also get some useful commentary! The post mortem event is one of the highlights of a course. Because of scheduling problems, our own mistakes in management, travel timings, stress and various other excuses, we forgot about the post mortems at this event. That was a mistake that I feel made many students feel disappointed, to feel as if their work was not appreciated. That still bothers me. When you've made something, you want to tell the world, and you should be given the chance to do that. And of course, we would have wanted to see those games presented, too. When a project course begins at KAMK, students must first pitch their projects to teachers and get them accepted. We did the same thing at the IGDC, but also kept on holding practice pitching sessions every Friday for the full duration of the course. That was great and should be continued - it was really motivating to see the improvements in the presentations made by the students. Some definite performers there. All in all, for me the overwhelming feeling left of this trip is positivity. My heartfelt thanks go to the motivated and friendly students, to the helpful faculty of the organizations involved as well as to the various other great people I (we) met on the way. The greatest motivator for me was always the progress and enthusiasm of the students who I would thank all personally did I have the time. Here's to hoping for more collaboration between Indian and Finnish educational agencies, and for more events of this kind in the future. This is really just a heads up for anyone who missed it: this year's GDC featured a new post mortem session for the now 20 year old Ultima Online, and the video is already available for free here. UO remains a source of interesting MMO history and design topics to this day. Although the session featured many of the same talking points as the post mortem in 2012, there was a little bit of new stuff there, too. For example, this time Richard Garriott himself took part, and Rich Vogel talked about the invention of game time cards. I only wish I could find an interview with Rick Delashmit, the original main programmer of the game. It would be interesting to know for example how they stored world state information and account data on disk back in the day! Note: this post contains personal opinions reflective only of the author's views and not necessarily of anyone else who partakes in the upkeep of this website. Often times nowadays, politicians in democratic societies appear as if they have completely abandoned ideology. Ideology is often frowned upon, at least if it isn't of the kind that emphasizes the growth of the markets, increasing the amount of foreign investments in the country, or something in that fashion. But emphasizing these points, of course, is not viewed as ideology at all - it is merely viewed as pragmatism through the narrow lens of market centricism. But sometimes ideology still makes an appearance. You've probably heard of many EU countries deporting Russian diplomats because of the poisoning of Sergei Skripal in Britain, an incident the culprit of, the UK and US claim, is Russia. Finland is amongst those countries. Now, I don't know who poisoned Skripal. But I believe that neither do Finnish officials. All they have, at least so I believe, is the word of two NATO countries, the US and the UK. And how trustworthy exactly is that word? In the traditional nationalist Russia-fearing Finnish mindset where everything that comes from the west is superior, held on to by a certain portion of the population, the word of said countries is apparently very trustworthy, at least if it's an excuse to provoke the grand eastern neighbour (which is rather analogous to playing with fire). Never you mind the UK only gave Russia a single day to respond to the accusations they made, or the fact no evidence of Russian interference has been released to the public. I feel as if Finnish politicians, those who are afraid of Russia at least, are forgetting what the best strategy has always been for "defense" in this small country between two great powers: neutrality. And diplomacy. Not only are we now making decisions based on no evidence, but we're risking our eastern relationship in the name of the ideology of West is Best, and not even for the first time. Of course, if it is proven Russia was behind the attack, it's a different matter. But this hasn't happened, not so far at least. Who hasn't heard the phrase "rewrite it in Rust"? I certainly have, and yesterday finally thought, "you know, maybe I should give the language a try - a safer version of C sounds pretty tempting". So I installed rustc, opened a quick tutorial from the web and dived in at the shallow end. I'm sorry, but I don't think its the job of the language to tell me how to name my data structures or variables, other than for things like whether they can include spaces/numbers or not, etc. I can go along with indentation marking scope, like in Python or other languages - I believe that's been proven to improve readability across the board. But I'm not interested in styling my naming conventions after the personal tastes of the creator of the language. I realize styling warnings can be disabled via compiler options, but if its in the standard, you probably shouldn't. So I guess that's it for Rust from my part for now. Unity recently decided to release it's engine and editor C# source code. The C++ core of the engine remains out of sight, and even the C# release is made under a reference-only license, meaning that modifying the source is not allowed. So, unfortunately we don't come even close to fulfilling the four software freedoms as traditionally defined. Unity seems to stress this themselves in the blog post. And of course, one may argue this means little since the C# source code could already be decompiled by parties interested. But I won't deny it's still a very small step in the right direction. The release, I think, is not that big of a deal though. Unortunately, Unity still appears to hold some old-fashioned views popular in the proprietary software sphere, as proven by this statement, taken directly from the Unity blog: We�d open source all of Unity today if we thought we could get away with it and still be in business tomorrow. I don't think that statement makes much sense. Of course taking a more open approach would require slight adjustments in the way the company does business, but Unity is already in the market of software as a service. It's not just the engine itself, its the documentation and updates people want. Even if they had a fairly open license that allowed reading, modifying and distributing source code, Unity could keep on raking in the money from the 5% they charge from people who make games built with their engine. The source being open would, I believe, really have no negative effects from this point of view. Also, knowing Unity's limitations (which are many), I'm fairly sure there's no such advanced technology inside the engine that it would do much for a competitor to read the code, especially considering their main competitor, Unreal Engine 4, already has it's source visible. Well, here's to hoping software vendors slowly come to their senses. Free/open source is not only ethical, but also practical - knowing your underlying technology from the inside out certainly makes it easier to make a good game. Async MySQL C API usage. Also, bugs. I believe wrote in an earlier post that I had lately been working on a (proprietary) database server with MariaDB. I have little experience with database programming, so I've had to look a thing or two up on the internet and documentation. What I'll write about here is, I'm sure, very old news to anyone who's done work in this area before, but to me it was fresh knowledge. So one thing I noticed about the MySQL C API, which MariaDB also uses, as I expect anyone who starts working with it would notice quickly, is that it isn't exactly asynchronous. mysql_query() is a blocking call that will connect to the server, send out the query and then wait for the reply, all in one function. I didn't want to use the API like this if I didn't have to, and thanks to the internet, finding a solution wasn't too time-consuming. That's thanks to Jan Kneschke who has written about a fix right here about ten years ago. Wait on the event interface until an event happens on one of the file descriptors, then call mysql_read_result(). Now I thought that was pretty handy. On Windows, I expect you could get similar behaviour using select(). This approach has worked well enough in my current project so far, although obviously things aren't quite as simple as in the example. I'm by no means very experienced in asynchornous programming (or any specific area of programming for that matter). So, writing a server program last week I ran into an interesting bug with a listening socket tracked by an epoll instance, which was really caused by me not thinking of the flags I passed to epoll properly. The issue was this: a thread was sleeping on an epoll_wait() call until either one of the client's would send something, or a listening socket would receive a new connection that needed to be accept()-ed. When an epoll event on the listening socket fired (a new connection arrived), a notification would be passed to another thread in the program, which would then call the accept() function. An important bit of informatoin is that there was an atomic counter for how many times accept() had to be called. Every time an epoll event was generated by the listening socket, that counter would be incremented, and it was by this counter the other thread would then call "accept()" when notified - a counter of 10 meant you had to call accept 10 times. But the accept queue on the other thread was being starved - clients constantly had to wait for long periods as the server would simply only accept one client at a time after having been running for about 15 minutes. Obviously there was a problem somewhere. Eventually I added another counter measure, which was to call accept() on the epoll thread immediately after an event and then pass the resulting file descriptor on to the other thread. This way, the listening socket's backlog shouldn't fill up before accept is called on another thread even under high load. Async bugs aren't the only bugs I've been fighting with this week, although this one was also obscure due to things having happened on multiple threads. Just two nights ago I tracked a heap corruption bug I thought was either happening because of OpenAL or the code calling it (which I didn't write) for multiple hours of work time. But compiling with gcc's -fsanitize=address flag, I realized it was just my own old code, in a completely different place. Oops! Good thing there are tools for easily detecting problems such as this nowadays! The attempt at poisoning Sergei Skripal, an ex-spy who used to work for Great Britain, has been on the news lately, and one can't help but wonder at the timing that coincides with the presidential election in Russia. It has been stated that the neurotoxin used in the incident was of Russian origin, and that may well be. But does that not sound a little fishy? I'm no expert, but I'm sure there are plenty of simpler and less suspicious ways to get rid of a person, ways that don't directly point towards the culprit. We all know that the East-West relationship hasn't been exactly at it's peak as of late. In the US, the debate/investigation on "election hackers" still seems to go on, or so I casually observe. Now, maybe it's just me, but what I see here is a potential motivation to stage Russia to have a part in something nasty. At the same time, Russia does have an election going on, and it does seem to me like it may be a fruitful time to come up with some East-West conflict that may benefit the current poll-favourite. Then again, I doubt he's really going to need the extra credibility to win. What ever the truth is, conflict between nations isn't nice, and neither is somebody being murdered. I've been lazy in terms of working on projects outside of work for the past month or two. I have not written proper updates for MUTA in probably over four weeks and before the ongoing week 10, I also had not touched any other non-work related programming projects. That's not to say I haven't been programming. Since the beginning of 2018 I have written a backend server for a game-related project (in C with MariaDB), and I have partaken in a collaborative game engine project (in C++). I just haven't touched any projects I have proper personal investment in, that's all. But that's about to change now. I'm looking forward to getting back to MUTA, for which I will likely begin writing entity scripting next. And this week, I've again been working on Jeesgen, the static website generator I wrote for the upkeep of this site. I knew a couple of features would be needed to make the site more functional, so I implemented them this week. It is now possible to generate individual pages for each post. This allows permalinking and easier linking to articles in general. It also helps RSS generation. Whether or not individual pages will be generated for each post is controlled by a config option in the jees_config.cfg file ('generate individual post pages = true/false'). Pages in this context are individual areas of the website which all share the same template (for example, they all have the same menu for site navigation, but different content). Previously if a new page was added to a Jeesgen project, it would automatically be added to the default navigation menu. After the update, in the original post file it is possible to specify the option 'create menu entry = true/false' to ignore the creation of a navigation menu item. This feature is handy when you want to create a page for something that doesn't need to be accessible from everywhere. For example, I may want to create a page for MUTA, but not have it appear up top there amongst the "News", "About" and "Projects" buttons. A feature I'm having problems with figuring out how to properly implement are RSS item descriptions. I like to include HTML in my posts so I in order to copy, say, the 256 first characters of a post to the description, I would have to make sure any open HTML tags are properly terminated so that they don't mess up the RSS XML. I don't see an easy way out of this, though one option could be to make the post format support Markdown, which would mean I would not have to use HTML to format posts. This isn't really related to programming or video games, but I like music, and especially I'm a big listener of electronic music. So in the name of spreading good music, below are a couple of interesting songs I've had the joy of listening to in the past few months. I don't know if the subgenre is Balearic or something else, but this one's a wonderfully calming track that I don't remember having heard of until recently, and neither have I paid much attention to the artist in question before. While the calming melody feels ambient, it seems to keep on playing even after the song is over. A fresh acid track that has an nicely driving bassline, giving the feeling of the beat crawling out of the listener's own head. An italo classic and one of the songs of that era I constantly return. Some slightly funky, chilled house music from 1998 and nothing else. Just pop music from the early 2000s. But with a disco/disco-house twist! And the music video is great. While programming as a an activity is something I, as many others, derive joy out of, there are obstacles that make it less appealing from time to time. One of those obstacles is C++. I know picking on C++ is a bit of a fashionable thing to do at the moment, but it's no wonder why: the language is easy to pick on (and it's widely used, for what ever historical reason). Well, lately I've been involved in a project utilising sepples and it's features heavily, and here's my latest gripe with the language: headers polluted with implementation details. Well, in the world of sepples where private and public are a (rather useless) concept, it's not that simple to keep our _modify_struct() function out of the user's sight. At least for now, I could not find a way to write the equivalent of the C example up there for a C++ class in the case where the function is to modify the class' private members, not without declaring the function in the header first. So yeah, I'm not a fan of sepples.